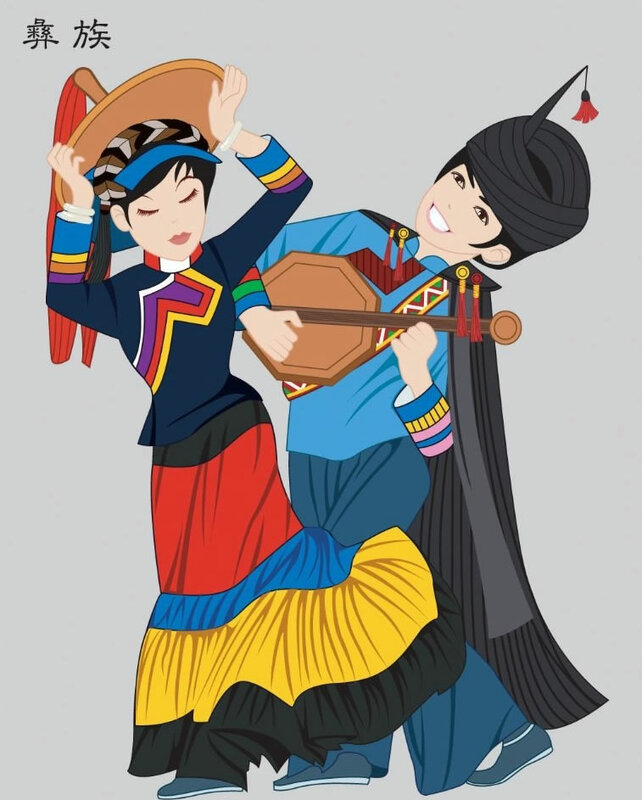 With a population of about 7-8 million, the Yi ethnic group is mainly scattered in Yunnan, Sichuan, Guizhou and Guangxi provinces, in which Liangshan Yi Autonomous Prefecture in Sichuan province holds the single largest Yi community in China. The ancestors of the Yi ethnic group can be traced back to the Qiang people living in northwest China. They later migrated south and joined the local southwest aboriginal and created a new group - the Yi ethnic group. The Yi people have their own language, which belongs to the Yi branch of the Zang-Mian Austronesian of Han-Zang Phylum. Yi characters, as the earliest syllabic script in China, were formed in the 13th century and are still used today. A number of works of history, literature and medicine as well as genealogies of the ruling families written in the old Yi script are still seen in most Yi areas. Due to cultural and economic exchanges with the Han, more and more Yi people learn to use the Han language and characters in daily life. Most Yi people engage in agriculture and a small percentage of them raise livestock. People living in the plains take rice, maize, wheat and yams as their staple food while those in the frigid mountainous areas mostly depend on maize, buckwheat and yams. Complements to their main food source include vegetable, legume, fruits, pork, mutton and beef. The Yi nationality used to believe in many gods and worshiped ancestors. Some people who lived with Han people also believe in Buddhism. There are a great many Yi costumes with unique designs stemming from various places. In the Liangshan Mountains and west Guizhou, men wear black jackets with tight sleeves and right-side askew fronts and pleated wide-bottomed trousers. Men in some other areas wear tight-bottomed trousers. They grow a small patch of hair three or four inches long on the pate, which is named "Zier", and wear a turban made of a long piece of bluish cloth. The end of the cloth is tied into the shape of a taper jutting out from the right-hand side of the forehead. Women wear laced or embroidered jackets and pleated long skirts hemmed with colorful multi-layer laces. Some women wear black turbans, while middle-aged and young women prefer embroidered square kerchiefs with the front covering the forehead like a rim. They also wear earrings and like to pin silver flowers on their collars. When going outdoors, both men and women wear a kind of dark cape made of wool, hemmed with long tassels that reach the knee. Yi people have many traditional festivals and the most important include the Torch Festival and the October New Year.